Magdi Abdelhadi meets Coptic Christians in Egypt as they elect a new Pope and prepare to hear what the countries new constitution will mean to their future. 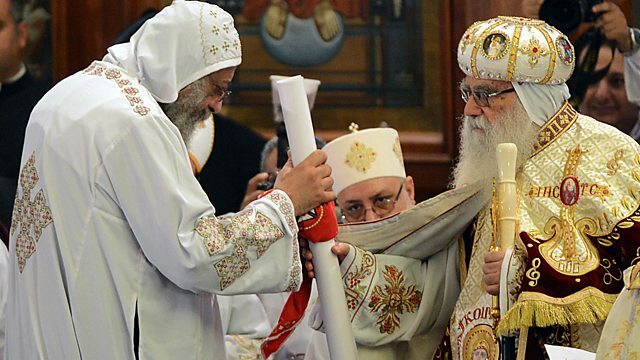 In an elaborate ceremony in the breath-taking St Mark's Cathedral in Cairo, Bishop Tawadros the Second was enthroned as the 118th Coptic Pope of Egypt, just a matter of weeks after his names was pulled from a glass bowl by a blindfolded schoolboy. Coptic Christians make up the largest Christian minority in the Middle East, but since the 2011 revolution, Islamists have taken control of the presidency and also dominate the body that is writing the new Egyptian constitution. Magdi Abdelhadi reports from Cairo on the fears of Egypt’s Christians that they will become further marginalised and discriminated against in a country that has been their home for nearly two thousand years and what the new constitution and a new Pope will mean for Copts in post-revolution Egypt.